Hi there stampers! 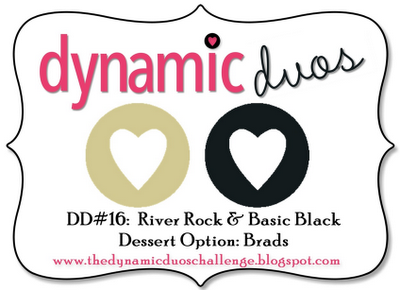 It's time for a brand new color combo over at Dynamic Duos! This week is our "Black Tie" challenge where we combine one color with Basic Black and throw in one extra element as a "Dessert Option". You can add that extra element (for this challenge it's brads), or not...either way, it's a lot of fun. We are featuring a color this week, that I rarely use: River Rock. I decided to try these colors on a Christmas card. I am a HUGE fan of Christmas cards in non-traditional colors. I have a whole bunch of new products in my studio from the SU Holiday Catalog. There is SO much fun stampin' stuff in that catty, it's awesome. *swoon* The new Ornament Keepsakes stamp set is gorgeous and the best part is, there is a matching set of die cuts to perfectly cut out the stamped images. That ROCKS! I heat embossed the ornaments to give them a more elegant finish and what "black tie" event is complete without some pretty pearls? I added the heat embossed sentiment by creating a banner, with the "tails" clipped off with the 1- 1/4" Square Punch. I kind of like how it pops off the card, so this one would need a larger envelope to mail, or just make the exclusive "hand-delivered" list. *wink, wink* All of the supplies I used are listed at the end of the post. Anne Marie this is so beautifully designed. Lovely colours and embellishments. Everything works together perfectly. Wishing you a relaxing weekend. Wow - was für eine tolle Karte! This card certainly is black tie. How elegant! I love the ornaments dressed up in pearls and that beautiful bow! Holy cow Anne! This card is so regal and elegant! It looks like a fine printed stationary from some swanky shop! Just gorgeous work and a fabulous design here! Love the black and cream! STUNNING Anne Marie! These ARE beautiful ornaments and I love the way you've glammed them up!! Girl!! My mouth done fell open! What an amazing card!!!!! If you made this on pain meds, please send some this way. I LOVE it! Absolutely stunning! SO classy! I need your meds! It's gorgeous - inside and out! Really like those two colors together and the ornaments wit the pearls are awesome! So pretty. This card is just beautiful!!! Love those colors together too!! I will be featuring this card on My Crafty Picks #74 with a link back to your blog on 8-19-12. Make sure to stop by to check out all the picks!! Wow - Puttin' on the Ritz as Fred would say! So classy and gorgeous in every way - and tied together perfectly with that wonderful bow! This card is absolutely GORGEOUS!!!!! This color combination is absolut F A N T A S T I C !!! It looks very elegant- gorgeuos work ! 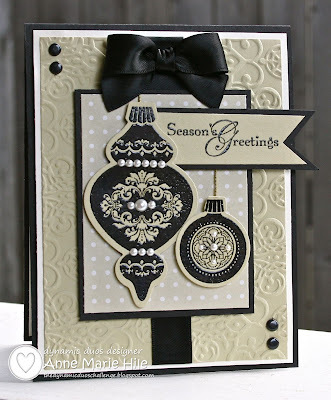 Gorgeous color combination, I love the embossing on your card. Stunning! Oh My.....What an absolutely GORGEOUS GORGEOUS card!!!!! So elegant and crisp....Beautiful job!!! Oh my goodness this card is utterly fabulous!!! That stamp set is my favourite from the new mini and your card is the best thing I've seen made with it - love, love, love it!! That colour combo works so well for a Christmas card and the embossing (both heat and textured) looks so elegant! This is definitely going in my 'case me' files! This is truly spectacular Anne Marie! I think it is one of my ALL TIME favorite cards EVER! Wow - you really outdid yourself with this card ... I saw that set in the Holiday catty and thought 'nah. But now I see your card!!! Wonderfully creative and elegant and fabulous! Anne Marie, I love what you have made with the new ornament set. This is stunning and oh so elegant! I bought the whole bundle and love it. Cant wait to play more with this set. You sure have given me some beautiful inspiration.Thanks! Beautiful! The colors are striking, the ornaments so pretty, and the pearls make the finishing elegant touch. OMG! What a beautiful , beautiful card! Absolutely gorgeous! Love the heat embossing and the little pearls! Simply Stunning Anne Marie, looks divine in the DD colours this week. Ann Marie I don't know how I missed this, but it's absolutely gorgeous! Love the tone on tone ....Hugs. PS: I feel like I'm so far behind and can't catch up lately! 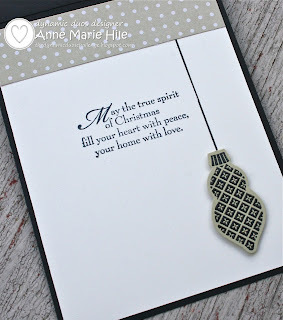 This is such a beautiful card Ann Marie! I just love it, all the elements are perfect! Such a WOW card. ooooh Stunning card. I love non-traditional colours for Christmas cards too!!! Stunning Christmas card. I was in awe the moment I saw it! Great job! This is just plain gorgeous! These ornaments on your card are exquisite, I am in LOVE with them. Such an elegant card. Beautiful amazing card! So many neat details, and a great job with the color combo! Elegance is the word that comes to mind when I see this card!! The recipient should frame it once Christmas is over!!! Definitely an elegant affair! This is incredibly beautiful and so very elegant! You blew this challenge out of the water! Beautiful! I love the non traditional colors. 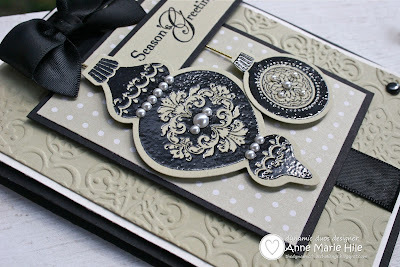 Stunning card, I am glad to see you used River Rock & Black together. I'll have to use that combination for a card too. Thanks for your beautiful and elegant card as inspiration. Have a Merry Christmas!